Confession time. I have a lot of ideas, some of them are DIYs but I am not the handiest person with tools, paint or scissors. Though I love DIYs, I don’t have the best track record of executing them. Nonetheless, I keep these ideas on hand in case I need them. I have a soft spot for the British because at a young age, I loved their music. The Union Jack is one symbol I don’t find cheesy or irritating. 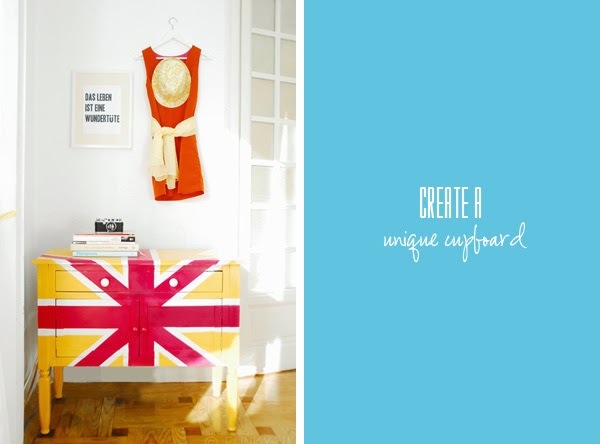 This cupboard DIY features the beloved DIY in a color palette that is meant to POP! Don’t you just love it?? ?